The Kulturtag is an artistic experiment started by the Oberscheid artist, musician and performer Rolf Schwechheimer in 2007. Over this period of time the festival grew from year to year – not only in audience feedback but also in duration and diversity. 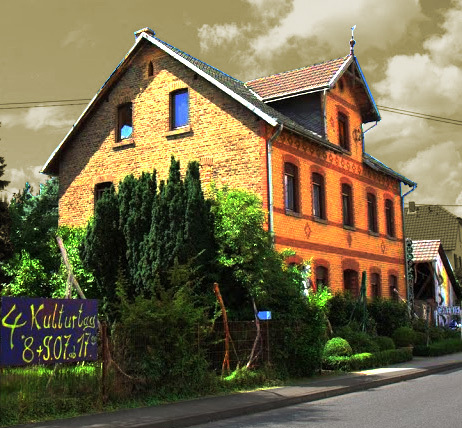 The event takes place in the former telegraph office of Oberscheid, which already acted in historical times as an intermediary between village and world. Here the artist created over the years an overall work of art in house and garden, which transfers the amazed visitor in a peaceful and inspiring world. Artist and visitor meet in a space of art. Within this space all forms of visual and performing arts, including music, are equally presented.